I first stumbled upon AMK Design Shop when I was perusing around Instagram late one night and her Baby Book Journals immediately caught my attention. Next thing you know I am looking through all her book designs and wishing I could have them all! What I love about AMK’s keepsake books is how simple and classic they are. I was never fond of the multi-coloured baby books you’d find at Chapters, and nothing seemed to suit my needs and wants. The black and white layout is clean, clear, and extremely gender neutral (having a son – I loved that it wasn’t too girly). Plus her prices are extremely affordable. All the baby books I seemed to be looking at were retailing upwards of $60-$80. No offense, that seems a little absurd to me. Just recently I had the pleasure of connecting with Alexandra over social media and got to know a little more about her and her business. Q: Tell me a little bit more about you, your background, etc. My name is Alex and I live in Chilliwack, BC, Canada with my husband and my two children. We farm our own Dairy and I am a Registered Nurse by trade. I work in the community and really enjoy what I do! I love being at home with my kids and my Etsy shop just sort of started up organically when I realized I wanted to share my books with the world and provide others with an affordable simple modern book to document their child’s lives, just as I want to do with mine. I enjoy doing yoga, hiking, drinking and trying new teas and drawing of course! I have always had a passion for art but had never pursued it until now. Q: What gave you the idea to create these keepsake books? After having my first baby I enjoyed taking the time to document her life in an online book I had created when she was born. Two years later when my next baby came, I was looking back through the album I had created for her and realized how many milestones I missed documenting along the way, thank mommy brain for that one. Anyways I decided when my second was born that I wanted to create a book that had everything in it that I ever wanted in a baby book and to be designed with a bohemian vibe. I also wanted to create a book that was fun to document in, simple, quick and easy. Ultimately, I wanted a book that didn’t miss a step and prompted me on what to document, I mean I can only remember so much! And so ta-da! My Baby Book was born. From there I created the Pregnancy Journal and then the other three books to follow. Drawing and designing is relaxing for me so I worked on the books in the evening when the kids went to bed and months later I ended up with these five books! Q: I love the simple and modern design of your books, did you design all 5 yourself? Yes, I did design all the books myself, from the layout to the graphics. I had many rough drafts before I came to the final product. I feel like the books reflect our lifestyle and are modern as well. Even though I love the designs, I guess I was a bit nervous when I released the books as an artist, I wasn’t sure what sort of feedback I would get on the designs and graphics I created. Q: What made you choose these specific 5 (baby book, pregnancy journal, etc.)? Having kids of my own now that are growing up rather quick these days. I created five books that allow me to document their lives from conception until they graduate. 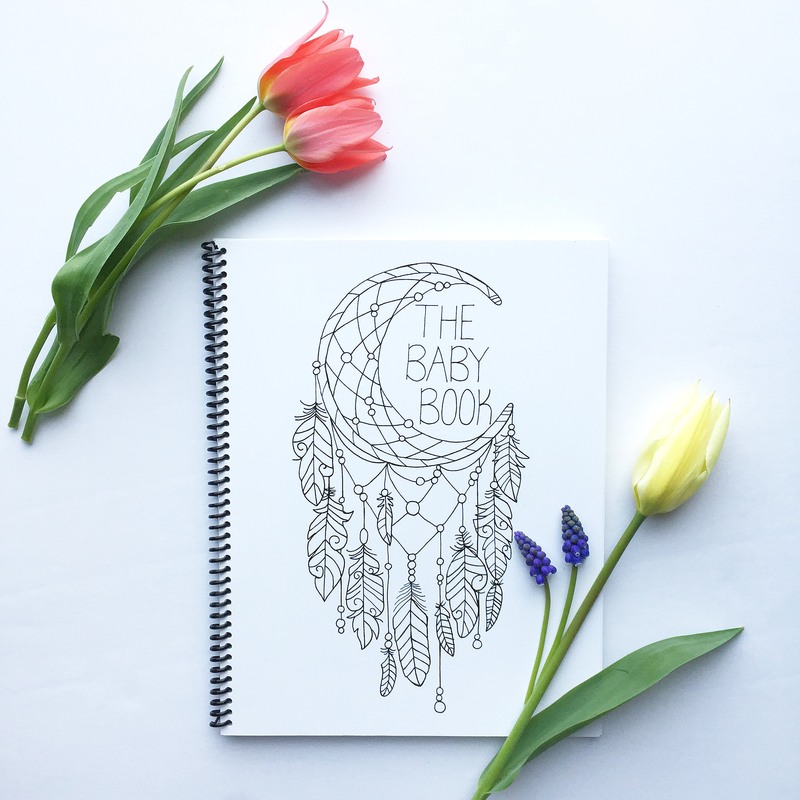 The Pregnancy journal is from conception until birth. The Baby Book is from birth until five years old. The First Year Book is up until the first year. Followed by the Birthday Book for all birthdays documented from birth until their 18th. Then finally the School Years Book, which is all your school years from preschool until Grade 12 graduation. It wasn’t until a little while ago when I was creating albums online for my husband and I of our childhood pictures that I realized all my school pictures had no years attached to many of them, which is why I created the school years book, so you can paste your child’s picture and ask them a few questions every year and see how they change and grow. I created the birthday book because I enjoy planning my children’s birthdays and I wanted a way to document what theme their birthday was, who came, gifts they got and what was on there cake etc.! Q: What is the message you want to give your customers when they are using your books? Ultimately, I want the families that purchase my books to enjoy documenting in them together, decorating them and then opening them up years down the road and sharing all the memories they had growing up that were documented through writing and pictures in my books. I want the children who receive these books down the road to cherish them and the memories that were made over the years and documented in a place they can always look back at and makes them feel at home.